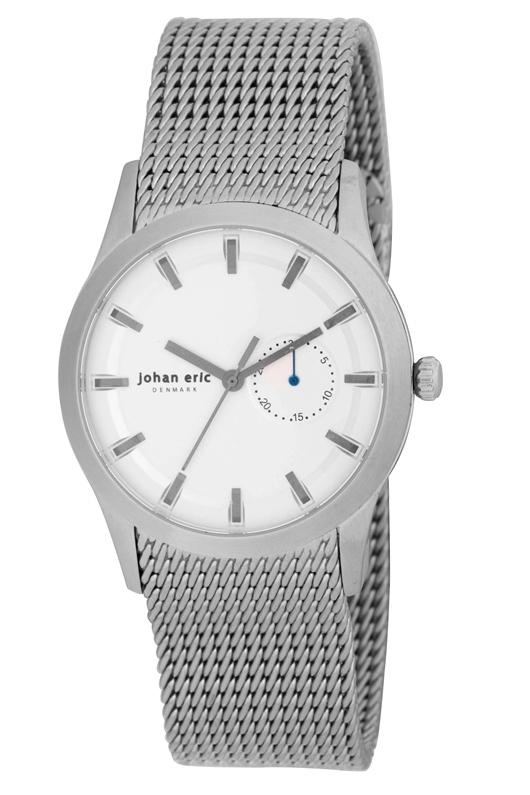 Though Johan Eric is a relatively new player in the watch game, the Dane, who lives in Randers on Denmark’s Jutland Peninsula, has designed a winner with the Randers Stainless Steel Sunray Dial. Johan Eric says the inspiration for the watch came from the peninsula, which is the reason for the model’s name. However, the design of the watch also reveals Johan Eric’s origins. Influenced by the German Bauhaus movement, Danish design was developed in the mid-20th century and is known for its simplicity and functionality. Prominent artists include Finn Juhl and Hans Wegner and the style is seen in the Sydney Opera House and the Egg chair. The Randers Stainless Steel Silver Sunray Dial reflects this simple yet elegant aesthetic. Your eye immediately travels to the floating off-center sub-seconds in an arc located between 8 and 12 o’clock, unusual for its positioning. But there is another detail that makes it stand out. Most running seconds show marks for each second. In this case, Johan Eric chose to demarcate five-second intervals for the first 30 seconds. The beautiful silver sunray pattern provides a nice contrasting backdrop for the black hour indices and Johan Eric logo, also placed in an untraditional location at 3 o’clock, yet this placement adds balance and contributes to the overall look. In a 42 mm stainless steel case, the Randers Stainless Steel Silver Sunray Dial watch continues the theme of surprises with the crown between the 7 and 8 o’clock positions. It comes on a leather strap with a crocodile pattern and closes with a buckle clasp. Johan Eric has established a distinct design aesthetic that’s captivating. 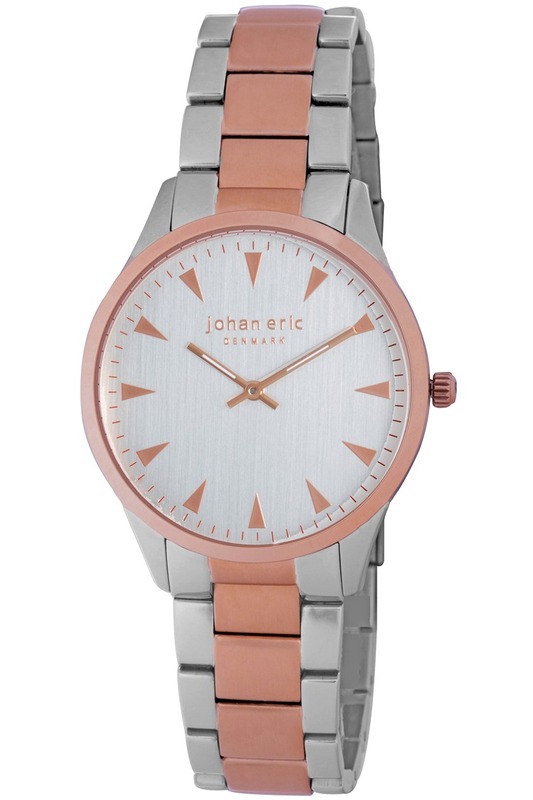 The Johan Eric Randers JE1500-04-001 watch possesses a wonderfully different style that reflects his Danish roots. If you’re looking for a watch that can work for all occasions and is both functional yet simplistic without sacrificing superior design, then this is it. 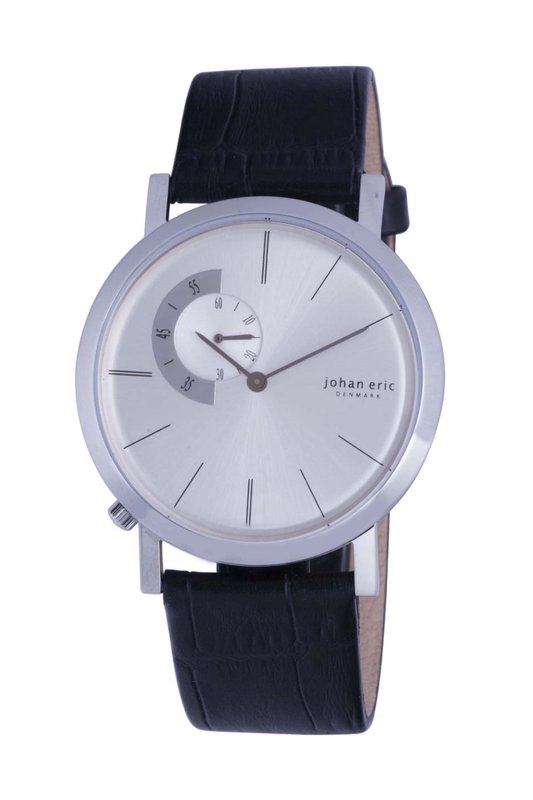 Johan Eric has earned a well-deserved reputation for capturing the essence of Denmark in a collection of uniquely contemporary watches. By focusing on the clean, simple lines that Denmark is famous for, even a city like Viborg, which traces its roots all the way back to 8th Century Viking settlements, can serve as inspiration for a contemporary classic. The Johan Eric Viborg Collection, like its historic namesake, is timeless and enduring. These handsome timepieces have a distinctly retro look that is reminiscent of some of the most iconic wristwatches from the 60‘s and 70’s. Featuring a minimal three-hand configuration, with classic, raised baton indices and a date window at 3 o’clock, the Viborg has all the hallmarks of a retro masterpiece. 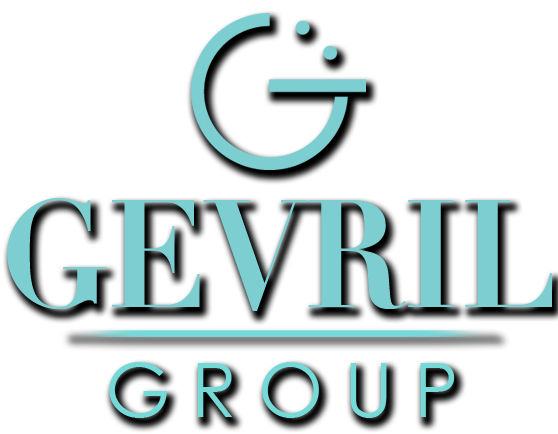 The distinctive collection is available in stainless steel, rose gold, and IP black, with a choice of black or silver sunray dials. 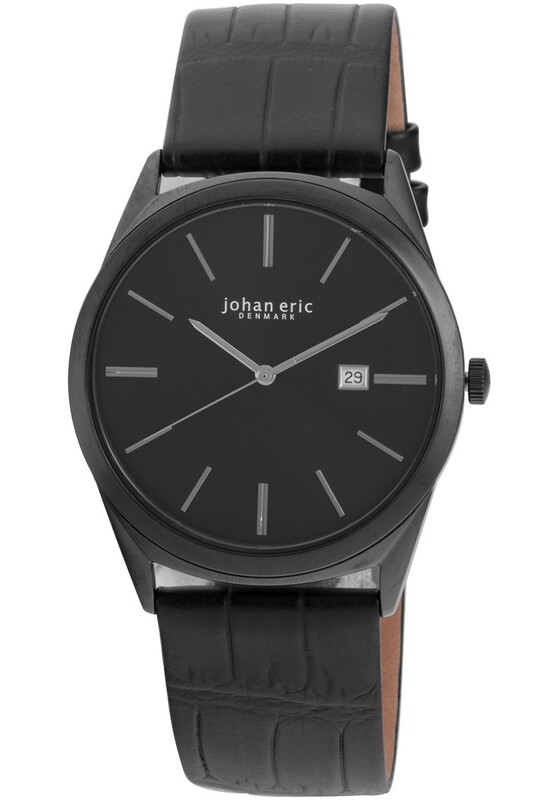 The 42 mm Johan Eric Mens JE8000-13-007 Viborg watch shown here, features a gorgeous black ion-plated stainless steel sunray dial that has been paired with a luxurious straight cut black alligator patterned genuine calfskin leather band. The slim, raised silver indices and pencil style hands provide the perfect contrast with an understated black dial that is adorned with a Johan Eric logo at twelve o’clock and a convenient date window at three o’clock. The Viborg features a durable mineral glass crystal along with a stainless steel case back that has been engraved with the Coat of Arms of Copenhagen. The distinctive Viborg JE8000-13-007 is powered by a precision Miyota GM10 quartz movement and is water resistant to 99 feet. If you like the retro look, this is the watch for you. 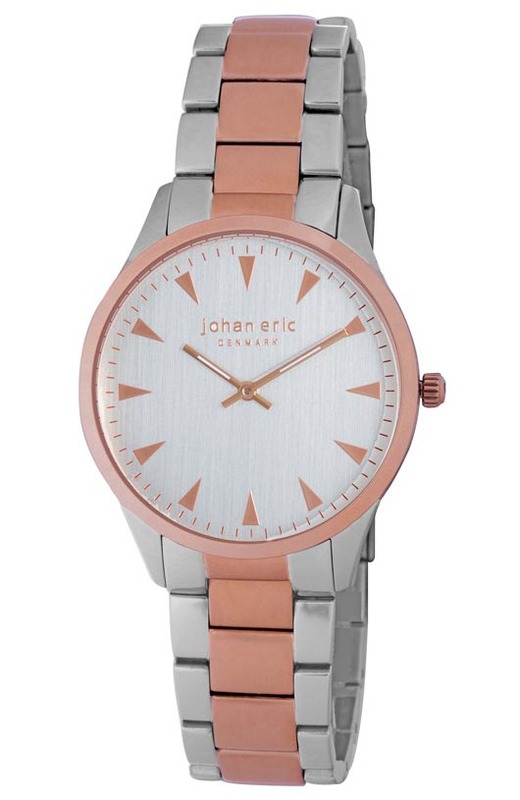 This elegantly slim timepiece looks great for both dress and casual wear and is protected by a 2-year Johan Eric warranty. If you have an appreciation for the old made new again, you’ll love the historic city of Viborg and the retro classic watch it inspired. To put one of these enduring looks on your own wrist, contact your nearest authorized Johan Eric dealer and ask to see the Viborg JE8000-13-007 today. Johan Eric has created a uniquely beautiful collection of modern timepieces by taking the clean, simple lines found in contemporary Danish design and updating them for the 21st Century. By combining a strikingly modern esthetic with innovative manufacturing techniques like vacuum ion plating and high-tech materials like carbon fiber, ceramics, and stainless steel, Johan Eric has managed to create a unique collection of watches that are superbly suited for today’s world. The classic simplicity of the Johan Eric Helsingør Collection provides a breathtaking example of why these modern Danish watches are so popular. The Danish city of Helsingør is known around the world for its famous Kronborg Castle where William Shakespeare’s classic masterpiece Hamlet takes place. The historic city also lends its name to another classic masterpiece: the Johan Eric Helsingør. The clean, uncluttered two-hand configuration of this timepiece features a large, easy-to-read dial with distinctive shaped indices. The understated design offers wearers a multitude of choices with a wide variety of color combinations, including stainless steel, ion plated rose gold, and ion plated black. These timepieces can be equipped with your choice of an elegant genuine leather strap or an integrated stainless steel bracelet. The Johan Eric Helsingør JE9000-12-001B shown here is absolutely stunning with a beautiful ion plated rose gold and stainless steel case that has been fitted with a contrasting stainless steel and rose gold metal bracelet. The distinctive 40 mm watch features a luxurious silver toned dial with triangular rose gold indices and a rose gold bezel. Like all Johan Eric watches, the Helsingør JE9000-12-001B is powered by a precision Miyota 2025 quartz movement and is water resistant to 165 feet. This is a watch you can wear anywhere and is equally appropriate for dress or casual situations. Unlike Shakespeare’s tragic Hamlet, the Johan Eric Helsingør has a happy ending for all who wear it. If you’d like to see how this timeless classic looks on your own wrist, look for your nearest authorized Johan Eric dealer and ask to see the Helsingør JE9000-12-001B today. Johan Eric Agersø: Inspired by a small peaceful island off the coast of Denmark, with an equally peaceful island on the watch dial to indicate the date. Johan Eric has developed a well-deserved reputation for their ability to reinterpret classic themes utilizing the clean, simple lines and impeccable craftsmanship that Danish designers have become famous for. By taking Danish traditions and updating them for the 21st Century, Johan Eric has created a uniquely beautiful collection of modern watches utilizing innovative manufacturing techniques like vacuum ion plating and high-tech materials like carbon fiber, ceramics, and stainless steel. The classic simplicity of the Johan Eric Agersø Collection represents the brand at its best. Instead of a traditional date window, Johan Eric Agersø watches utilize a small floating calendar dial at the 3 o’clock position to indicate the current date. The beautiful, small island of Agersø off the Danish coast inspired this innovative configuration. Using a small floating calendar dial instead of the traditional date window provides a clean, modern way to tell the time and date at a glance. The Johan Eric Agersø JE-1300-04-001 featured here has the look and feel of classic timepieces that employ a small continuous second hand, but it conveys even more information, since the three hand design includes a sweep second hand as well. The understated 42 mm stainless steel case has been fitted with a beautiful, integrated metal mesh band with a deployment buckle that gives the Agersø a cohesive, unified look that is suitable for both dressy and casual occasions. This is a timepiece that today’s modern man would be proud to wear anywhere. Like all Johan Eric watches, the Agersø JE-1300-04-001 is much more than a pretty face. A high quality Miyota 6P26 quartz movement powers this precision timepiece, while a durable, screw on stainless steel case back keeps it water resistant up to 165 feet. Like the Danish island that inspired it, the Johan Eric Agersø is a peaceful refuge of tranquility in a hectic world. If you’d like to what this inspired design looks your own wrist, make a date to see an authorized Johan Eric dealer today and reserve your own Agersø JE-1300-04-001 immediately.